Mention Christmas and soldiers in the same breath and most people can relate something about the famous 1914 truce on the Western Front. While the media gets carried away with stories of football matches in no man's land, Christmas was, of course, celebrated in other places by soldiers of Christian nations and not just during the Great War. My research has fetched up some fascinating tales of how troops in East Sussex celebrated Yuletide during World War Two; below are some accounts across the war years. The first Christmas of the war for troops on the Home Front was not the one they were expecting. War had broken out three months previously and the devastation of British cities by enemy air raids promised by some theorists had not materialised. The British Expeditionary Force was manning part of the front line in France, where too, nothing was happening. Life for the searchlight crews of the Territorial Army was quite harsh; a lack of proper accommodation and facilities was affecting morale. Boredom was a problem; with no German bombers to light up, a few RAF aircraft were drafted in to provide some practice. With a very cold winter in progress, celebrating Christmas was a welcome distraction from the Phoney War. The photo at right is from a newspaper cutting from December 1939, and shows some men of a searchlight detachment decorating their hut. With some cross-referencing of archive documents, I've managed to locate this unit as being at Cuckmere Haven. They have the luxury of a Christmas tree and balloons - the latter would not be seen again until after the war due to rubber being a precious war material. The troops had a "secret Santa" organised for Christmas Day, each man receiving a present worth up to sixpence. 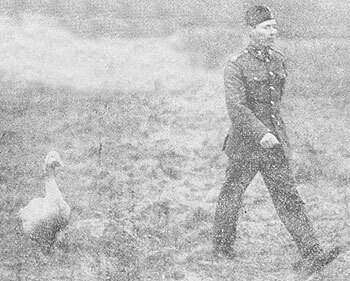 The only thing we know about the mens' Christmas dinner is that they had a turkey, which was good news for the detachment's other mascot, a goose by the name of Sapper Gander (photo at right). This gander accompanied the men around the site as they performed their duties (no jokes about goose-stepping or "propa-gander" please). 1939 was the only ration-free Christmas of the war, but, as we shall see, there was still some good fayre to be had in subsequent years despite the hardships to come. 1940 had seen the course of the war take a downward turn for the Allies; France had fallen and the threat of a German invasion of the UK was very real. In late October, a changeover of infantry divisions defending the coast took place with Christmas in mind. 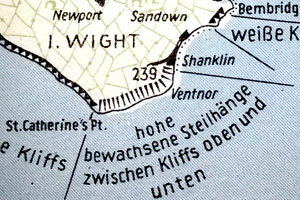 From May 1940, East Sussex and part of Kent had been held by 45 (Wessex) Division and they were relieved by 44 (Home Counties) Division. The reason for the change was to move some of the Home Defence divisions closer to their home bases so that personnel could be nearer to their families over the festive period. 44 Division (and its 'duplicate' formation, 12 (Eastern) Division) comprised regiments from Kent, Surrey and Sussex. No doubt 44 Division's move helped raise morale at the end of what had been a very testing six months. The division had fought with the BEF and been evacuated from Dunkirk. 12 Division had suffered such horrific casualties that it was disbanded shortly afterwards. The serious nature of the invasion threat meant that Christmas day was not as relaxing as it might have been. The troops were theoretically given a day's holiday, but proceedings were hampered by the ever-present invasion scare. Despite this alertness, the diaries record Brigadiers visiting their troops as they had their Christmas dinner. The 1/6 Queens Regiment also mixed with local inhabitants, the residents of Wadhurst hosting parties for the men. Every man of the battalion had turkey, a pint of beer and five cigarettes for his Christmas dinner. Forward Companies...worked with a system of reliefs for the defences. Owing to this necessity for the battalion to be ready to meet any eventuality...and keep an extra watch and vigilence, no excessive entertainments could be allowed. As the weather was suitable for a raid from the sea, 60% manning was ordered at 2015 hrs until Stand Down. 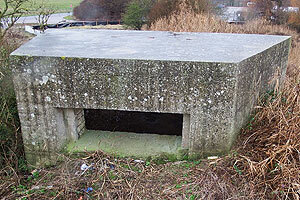 So Christmas Day 1940 ended with the troops manning their pillboxes and slit trenches against the threat of invasion. 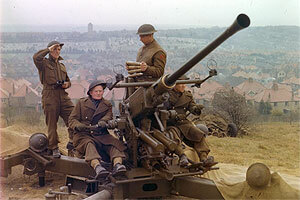 1941 saw the first large Canadian formations in East Sussex. Canadian war diaries tend to be far more detailed about everyday life, which yields some fantastic stories. The war had moved on; the threat of invasion had receded from the previous Christmas, although leave was restricted in case something should happen. The civilians in Eastbourne invited several of the men to their homes for Christmas dinner, which we eagerly accepted as some of the lads get mighty lonesome this time of year. 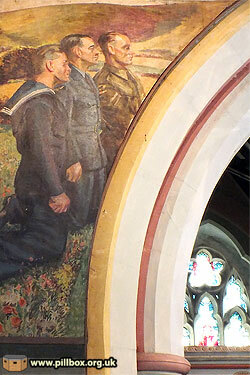 The Calgaries attended Communion at Berwick Church on Christmas morning; it's quite possible that Duncan Grant had completed the mural on the chancel arch by this time, including the three servicemen seen in the photograph at right. Several battalions make reference to all ranks receiving a gift box from the YMCA, which included candy, gum, soap, a comb and razor blades. One unit states that each man also had 300 cigarettes - compare this to the five the British had been given the previous year! Christmas Day, the Calgary Highlanders will sit down to the time-honoured Canadian Christmas dinner of turkey and all the trimmings. This has been made possible through the generosity of our Honourary Colonel Lord Bennet of Calgary who has played Santa Claus to the extent of a donation of 100 pounds. Not only will there be 350lbs of turkey but the Mess Committee have secured ample supplies of Xmas Pudding - mince pies - Canadian apples - fresh vegetables - fruit - nuts. And for breakfast there will be eggs. The mess rooms and tables will be decorated as far as possible and beside each man's plate will be a bottle of beer. Cigarettes will be distributed and Christmas boxes will be given to all by the Y.M.C.A. The Messing Committee have worked hard on all the details and are promising a sumptuous repast. Much credit and thanks are due to Lt. Don Munroe and Cpl McCrae for their efforts in obtaining all the supplies under restricted conditions. Things were not so rosy for one officer of the 5th Canadian Infantry Brigade however; he was unceremoniously debagged at a party! The Brigadier and the Brigade Major visited virtually every platoon in the Brigade throughout Christmas morning, shaking hands with each man, before returning to HQ for dinner and to listen to the King's speech on the wireless. May I on your behalf express our most heartfelt sympathy to those who have lost so tremendously by the heroic stand of our Canadians in Hong Kong. We shall avenge them! The Japanese had attacked Hong Kong on December 8th; little did the Canadians in Sussex know that the battle would end on Christmas Day. Christmas 1942 followed a similar format across 1 Canadian Division; officers served dinner to their men in line with army tradition and there appears to have been no problem with sourcing good food. Christmas Day is the mens' day. The QMs and cooks excelled themselves at dinner, with menus that are really surprising for the army. The Sergeants waited at table and the junior NCOs washed the dishes after dinner. Everything went well at all Company messes, and the men were all in high spirits. This, the fourth Christmas away from home, but showing signs of action during the coming year and victory for the UNITED NATIONS. 1942 had seen the disastrous raid on Dieppe that cost over 900 Canadian lives of the 2nd Division, but the war diaries all record eagerness to see action. Canadian diaries are very reflective, especially at the end of the year, and for the 1st Division, their expectations would be met as they were to be sent to Sicily and Italy in 1943. 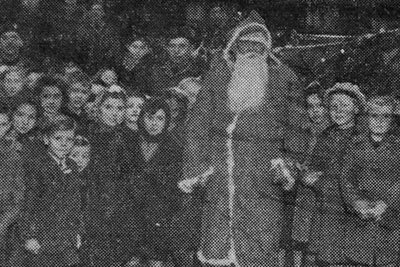 We've seen above that troops mingled with the local populace at Christmas, but in 1942, a more organised interaction took place in the form of parties held for local children. A common theme was that the troops contributed sweets and chocolate from their rations and parcels from Canada in order to give them to the kids via a Santa Claus. The Princess Patricia's Canadian Light Infantry's party entertained about 500 children at Willingdon, the highlight being Santa Claus arriving in an army jeep! The crowning event was when...Private Ward, A., Chief Little Eagle, appeared in full Indian dress and performed a war dance. The youngsters, many of whom have never seen a Red Indian and probably never will again, were most interested and pleased. 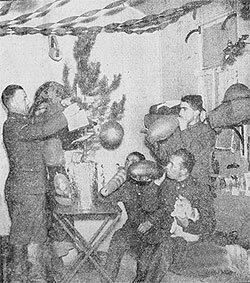 The weather is still cold, but not particularly noticeable, owing to the number of hangovers from an exciting Christmas.... "C" Company endeared themselves to the youngsters at Pevensey by putting on a party this afternoon at 1400 hours, in the Mess hall. Candy and sandwiches were provided, while the Pipe Band and Company artists supplied the entertainment. The chief turn, as far as the kiddies were concerned, was a full-blooded Indian, from another battalion who amused them with Indian dances. His fancy battledress, complete with feathers, in true Highland style. 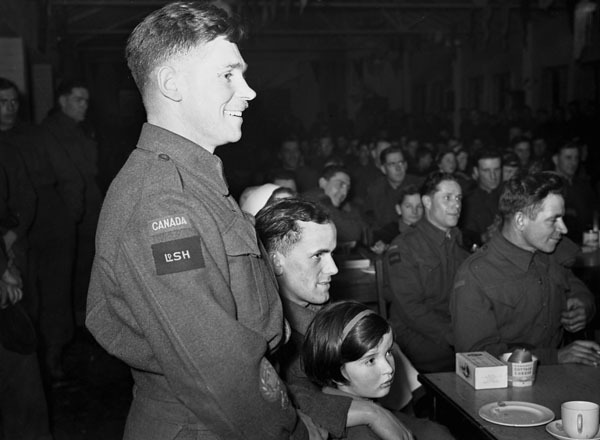 The photo below is a rare view of a Canadian Army party for children; taken on 23 December 1942, it shows men of Lord Strathcona's Horse (Royal Canadians) at what I believe to be Maresfield Camp. In the afternoon the Unit Orchestra proceeded to the Heritage Home for Crippled Children and gave a concert and gave presents to the bedridden patients in the home. Another party from this home was brought to the Unit for a party and concert in the Regimental NAAFI. Gifts of books and toys made by members of the Unit were given to all of them after they had visited Unit Lines and Vehicle Park. On the return trip from the hospital an "A" Squadron vehicle struck a cow and was slightly damaged. The cow had to be destroyed. 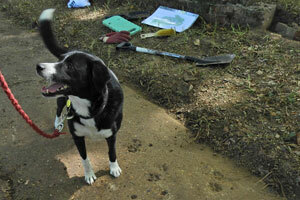 The home in question was probably the Chailey Heritage School about five miles from Maresfield. The visit around the vehicle park must have been quite a spectacular sight for the children, as the Regiment had a mixture US M3 Lee tanks and Canadian Rams. 1943 is the last year for which I could find interesting descriptions; the British documents of 1944 are distinctly lacking in the detail that the Canadians provided. Christmas 1944 for many Canadians was a world away from those they had spent in Sussex as they ate Christmas dinner from a mess tin in a slit trench on the front line in Italy or North West Europe. The uniform success of these events has been a matter of gratification for the Army Commander. Not only have they proven wholesome and pleasant means of marking the Christmas festival, but they have deepened and enhanced the feeling of comradeship and feeling between those concerned. Our final (and my favourite) story comes from No.1 Canadian Special Hospital based in the grounds of East Sussex County Mental Hospital at Hellingly. In December, two trips had been made by officers to Eastbourne to buy presents for the children; money had been raised from band dances and the troops had again donated a month's worth of chocolate ration. 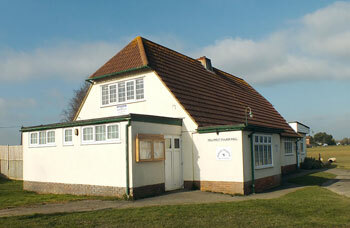 Hellingly village hall (Photo at right) had been decorated and a Christmas tree installed; the YMCA set up their film show equipment. Held our Children's Xmas Party at 1400 hours this PM, opening with 3 comic movies (Donald Duck, Popeye etc.) followed by a whacking big tea, tarts, cakes, sandwiches, cocoa and Coca Cola, during which a variety performance was put on by four children. Then Santa Claus appeared complete with bags of presents and proceeded to call out the names and hand gifts and stockings of candies to the kiddies, some 67 of them. In 2018, I wrote a follow up to this, covering Christmas Day 1944-45.